By 1989, when I returned, everything had changed. When I visited that same embassy the first week of March, a U.S. official talked openly to us — and presumably to the KGB eavesdroppers — about how, as the impending March 15 demonstration seemed to get bigger, Soviet leader Mikhail Gorbachev was not responding to pleas for instruction from Hungary’s communist rulers. “We don’t know what to make of it,” he said. ….It all began to come into clearer focus two months later, when Hungary removed the barbed-wire fence along its border with Austria and told guards not to shoot those who wanted to cross. Months after that, the Berlin Wall fell, and two years later the Soviet Union dissolved, albeit with fewer memorable images. Before the decade was out, Viktor Orban, one of the mildly rebellious students whom we’d interviewed in 1986, had become prime minister of Hungary. In retrospect, some things that seemed puzzling at the time now seem so clear. The embassy wondered why Gorbachev was ignoring the Hungarian leaders’ plea for assistance. But as it turned out, his not responding was central to all that happened next. Months later, he also didn’t take the calls from panicky East Germans seeking guidance for how to react when the wall was breached. He had decided to disengage, and that made all the difference. By 1989, the Soviet Union was so far in hock to western banks that they basically had Gorbachev by the balls. He couldn’t afford a repeat of 1956 or 1968, and when that became clear the jig was up. 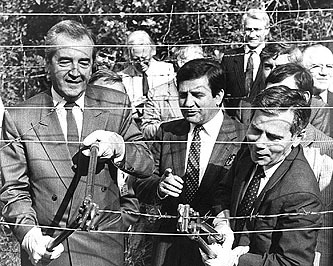 Hungary went first, Berlin followed, and within a few months the Iron Curtain was on the ash heap of history. In the end, it was hard currency, not ICBMs, that brought down the empire.